Recent Japanese economic data were positive on balance: while the Tankan index for big manufacturers’ sentiment softened in the first quarter 2019 from the previous three-month period, retail sales inched up 0.2% over month in February after 2.3% decline in January, and housing starts rose 4.1% from 1.1% over year in February. And while services sector expansion slowed a bit in March as Nikkei Services PMI ticked to 52 from 52.3 in February, the manufacturing sector contraction slowed. Most of the decline was due to weaker foreign sales to China and Taiwan. But international trade prospects have been improving lately with China’s Vice Premier Liu He arriving in Washington on Tuesday for a continuation of high-level talks held last week in Beijing after U.S. Chamber of Commerce executive’s comment “ninety percent of the deal is done, but the last 10% is the hardest part” about talks’ progress so far. 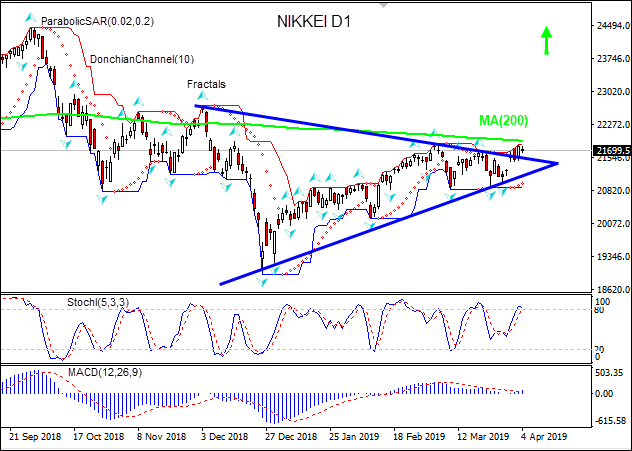 Positive data are bullish for NIKKEI. On the daily timeframe the Nikkei: D1 is rising after hitting 19-month low in the end of December. The price has risen above the resistance line, this is bullish. We believe the bullish momentum will continue after the price closes above the upper boundary of Donchian channel at 21834.2. This level can be used as an entry point for placing a pending order to buy. The stop loss can be placed below the fractal low at 20870.8. After placing the order, the stop loss is to be moved every day to the next fractal low, following Parabolic signals. Thus, we are changing the expected profit/loss ratio to the breakeven point. If the price meets the stop loss level (20870.8) without reaching the order (21834.2), we recommend cancelling the order: the market has undergone internal changes which were not taken into account.